Cast off from the dock 6:25, low tide and a light east wind. Under power. Wave to Rudy and Jill Sechez aboard their self-designed, self-built sail assisted trawler BRINEY BUG, new friends from yesterday. 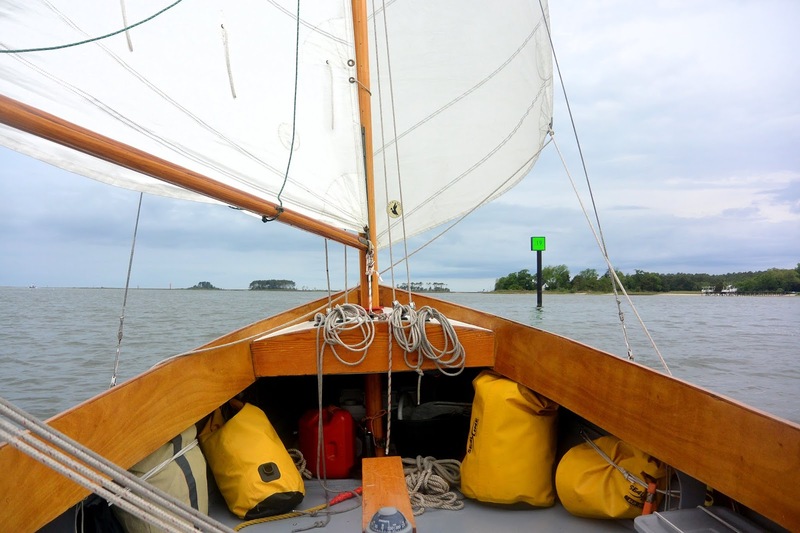 They are raising anchor, headed for the Pocomoke River. Low overcast looking like it might break up. South wind and sails up at 6:50, sailing down Onancock Creek. 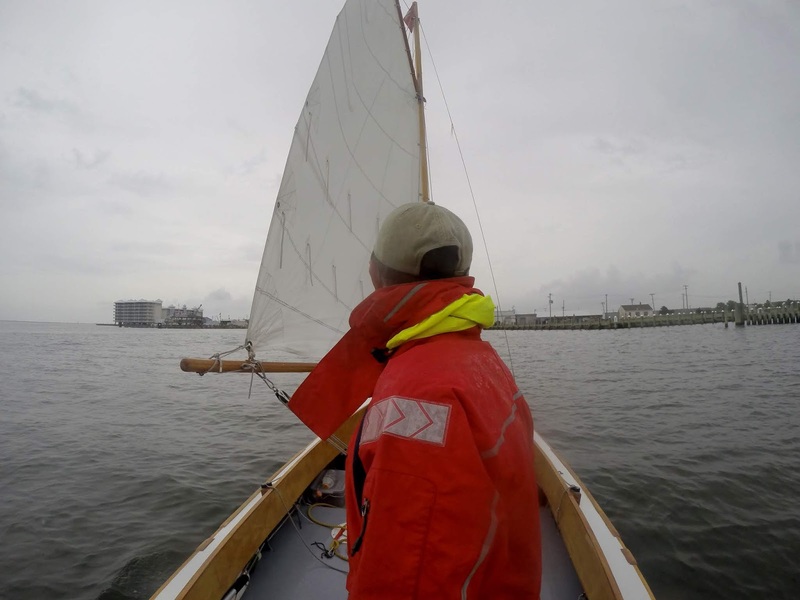 More wind and soon making 4 knots towards the bay. 7:35 pleased to find the entrance channel to Onancock Creek calm. Just before 8:00 pass the entrance marker and turn NNE. Patches of rain to the east. Making 3.8 with wind over starboard quarter when the rain finds us. The rain comes as goes. Past the shoals that reach out from beach island the shore to the east is just a distant line of trees. Checking weather the forecast is not good. Morning rain, afternoon thunderstorms. Light winds except for around thunderstorms. The same for tomorrow, the day after and the day after that. Almost 10:00 and I can see the houses at Saxis above the marsh to the NE. Light winds. Flies, lots of biting flies. Light winds, 2.8 towards Saxis. 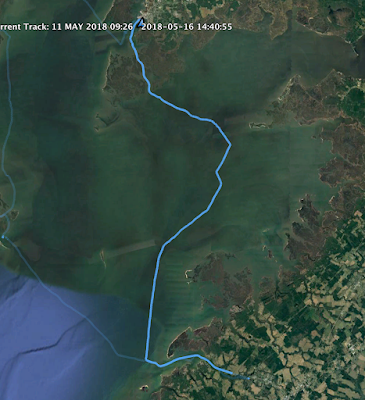 I think about following BRINEY BUG across Pocomoke Sound, maybe even into the river. Still a couple of hours from Saxis an early lunch of tuna fish, fruit cup and granola. The wind comes and goes. Checking the forecast doesn't make it any better. Just after noon, no wind. Grey all around. Check the forecast one more time, rain and thunderstorms for the next four days. I decide to let the wind choose my plan. Two miles from the entrance to Broad Creek, though I can't see it in the thin line of low-lying marsh, I will go through the creek to the Little Annemessex River. 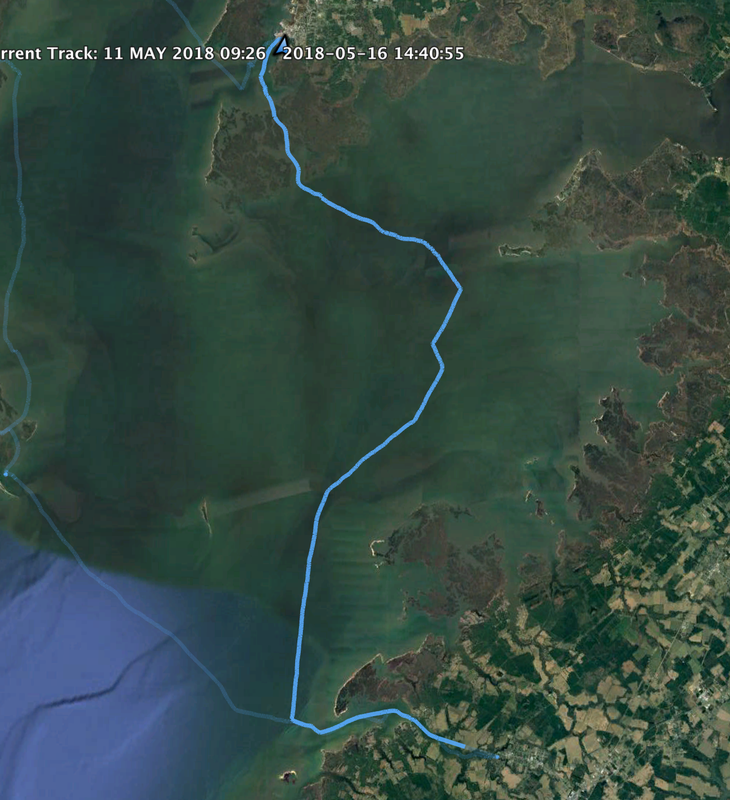 If I find wind on the river I'll sail to Tilghman Island, maybe visit Tylerton there, or back north to explore the Big Annemessex. 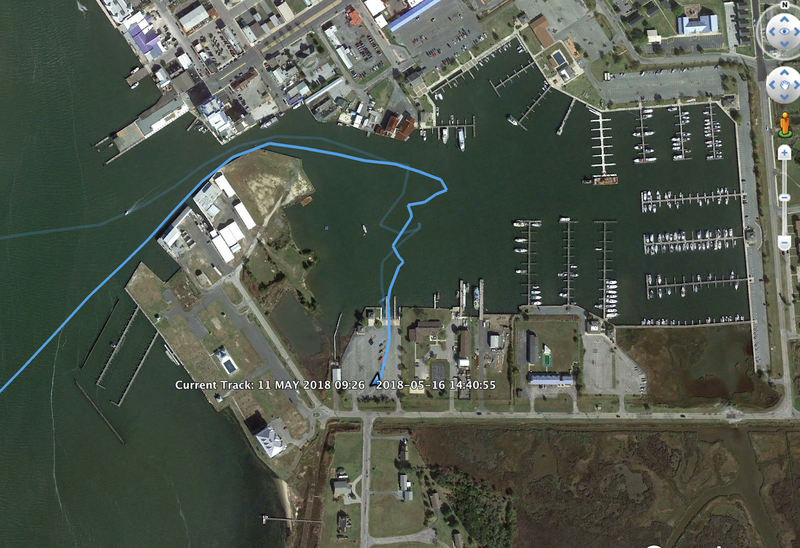 If no wind, I will head back to the dock. I see a waterman up ahead turn toward the marsh and I follow him towards the creek entrance. 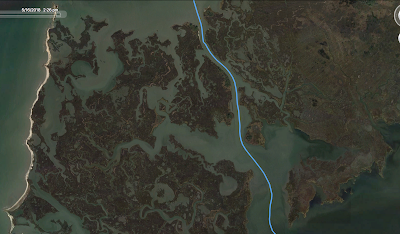 Broad Creek is a winding path through the marsh grasses, pleasant and peaceful. I've gone through it several times, mostly under sail. Under power today, just the mizzen raised. 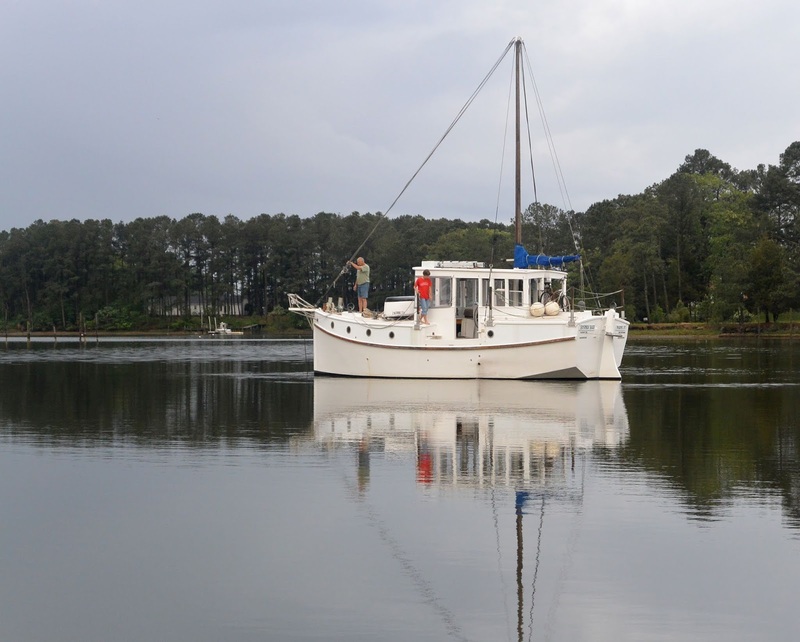 Another crabber comes up from behind in a large open boat, a crewman sleeping on the side deck. I turn into the big wake he leaves behind and continue north. The Little Annemessex, light drizzle, no wind but I raise the sails anyway hoping for something. I check weather radio one more time. Rain and thunderstorms are all it says. Frustrated, disappointed. I am not a purist about sailing, I don't mind using an outboard. But I am a purist about having fun, and rain with no clearing in sight is not fun. I drift for a while, then motor sail into Somers Cove. Back at the dock 2 pm, glad for the six days on the Sound. I break down SPARTINA'S rig in the drizzle.